Public Parks NOT Private Playgrounds – Get Back on the Track! Kangaroo Island Update 19/02/2019 forwarded from Janine Macintosh, Bushland Conservation member and a passionate advocate for the KI environment. Friends of Parks members on Kangaroo Island have ceased volunteering on parks and reserves in protest over the decision to build two luxury private accommodation villages on prominent fragile coastal sites in wild and unspoilt parts of Flinders Chase National Park. The sites are outside the development zones listed in the Park Management Plan (Amendment 2017). There was no community consultation. What are we protesting about? The 5-day Kangaroo Island Wilderness Trail already has four campsites adjacent to existing road access and discreetly located in secluded sites away from sensitive coastal habitats. However, the Department of Environment and Water has endorsed a proposal by the Australian Walking Company to develop two private luxury accommodation villages away from the Trail: • each village has 10 substantial buildings, plus water tanks, lookouts and connecting paths • they are located up to 3 km from the Wilderness Trail • they are conspicuously placed on pristine coastal sites overlooking wild and remote beaches • an additional 3 km of road will be bulldozed through native vegetation to service them • they require an additional 7 km of cleared walking track to connect them with the Trail. What do we want? The Minister and his Department to return this development to the one specified in the Management Plan and in the investment documents: that is for small scale luxury accommodation along the trail, close to existing road access and away from the sensitive coastal zone. Talk about it through your networks. The Friends of Parks KI Western Districts and Friends of Dudley Peninsula Parks have suspended all voluntary work on DEW managed land, including the planned FCNP Centenary celebrations. We’ll be working on private land instead! The weather was fine, the campsite a delight, the company excellent and the AGM went well too. 17 shareholders attended and it was quite inspirational to have Doreen Matheson there. Julia, Daniel and Brodie from our youngest generation took the initiative to supply us with afternoon tea during the meeting. Well done and thank you. We had 2 visitors camp with us and 6 guests on the day. The Chair, Bill Blessing, welcomed all present and spoke briefly on the recent death of Jeanine Vincent who has been a strong supporter of our Company and a dedicated environmentalist for many years. Our first guest, Karleah Berris, attending with her family, spoke of the planned cat eradication program for Dudley Peninsula. She demonstrated how the “Felixer 3” trap worked – basically it uses video recognition software and 4 sensors to determine if an animal is a cat. If it is, it is hit by a globule of 1080 poison which it will then ingest by grooming itself and consequently die. At this stage no poison is being used and the software is being tested and upgraded to improve its recognition rate as it currently would only target 50% of cats which approach it. Our second guest was Pat Hodgens who spoke about “Land for Wildlife” and their work in trying to establish the number and distribution of the KI Dunnart and the Southern Brown Bandicoot on KI. He is very passionate about protecting these animals and keen to set camera traps on our property to determine whether they are present though it is not expected. Permission to do this was granted. Bill Blessing and David Smyth were elected as Directors and retiring Director, Janet Pedler, was thanked for her valuable input over the many years she has served on the Board. The property reports highlighted the lack of rain on the mainland, the excellent turnout for Bill Matheson’s memorial planting day at Rockleigh and that TERN (Terrestrial Ecosystems Research Network) had revisited the Tothills and had permission to set up sites on our KI property. One of our KI shareholders, Dr Richard Glatz, will meet with them when they visit. One worrying aspect for the management of our KI property which was mentioned by John in his recent newsletter is the tracks being forged by trail bike riders. The next AGM will be held at Rockleigh on a date yet to be determined. This will be followed on the Sunday with an open day to which neighbours and other environmental groups will be invited. We have decided on the weekend of July 7th and 8th for the annual planting day at Rockleigh, which this year is in memory of our much loved and respected Bushland member and Director, Bill Matheson. We welcome you all to come to our Rockleigh property to help with the planting and celebrate Bill’s contribution to our company. Bill and Doreen’s friends and fellowship group from the Magill Uniting Church will be joining us on the Sunday. *We will meet at the old campsite. *For those able to assist with planting please bring your tools and other suitable equipment, and your lunch. Long-handled (post hole) shovels and mattocks or hoes are best for the sandy ground at the planting site. Planting will commence from about 10 am at the old campsite. Lunch around 1 pm. Please bring your lunch, the billy will be boiling and we will provide tea, coffee, fruit and cake. Planting will commence at 10 am at the old campsite. Lunch around 1 pm. Please bring your lunch. Doreen and friends will come around 1.30pm for the brief commemoration and afternoon tea. The billy will be boiling and we will provide tea, coffee, fruit and cake! Please contact Bren (on Bren’s phone: 0430 595 947 or Bis’s phone: 0400 254 350) as soon as possible so we know how many seedlings we have for planting. We hope as many of you as possible will join the directors camping at the new campsite on Friday and/or Saturday nights.Do feel free to come even if you are not able to assist with the actual planting work. Hope to see you there. The Board met in February and set the date of the AGM as the 6th October. This is the Saturday of the middle weekend of the school holidays. As reported in the last newsletter it will be held on our property on KI. As it is school holidays you may need to book the ferry early but it does not clash with the long weekend which is the weekend before, Monday 1st being Labour Day. For anyone able to come but not wishing to take their car, arrangements can be made to collect you when the ferry docks or to organise a ride all the way with some-one else. We are hoping to arrange a tree planting weekend at Rockleigh during the period 22nd June and 9th July. Just when will depend largely on how the season develops and may well be earlier or later. On the Sunday Doreen Matheson is hoping to scatter Bill’s ashes but more on this later. The planting will be a memorial to Bill and take place below the old campsite. Apart from planting, we hope to be able to remove and reuse a lot of guards from dead plants or those big enough to do without. Several of us will be camping over the weekend. We encourage you to join us and invite family and friends to either camp with us or join us for the day. We would encourage the younger people to enjoy our property and learn more of our Company’s vision to restore and conserve our land. The updated Management Plans have been completed and copies delivered to those who requested them. Digital copies have been made available as attachments to newsletters over the last 12 months. The revised “History” is attached to this one. Again, many thanks to all the people who contributed to make this possible. As you may well be aware by now, Minister Hunter stopped the sale of the coastal fringe to the Company wishing to establish the golf course. Thank you to all those who sent submissions and for the positive response from many members to the Company’s submission. The Minister acknowledged the fact that it was the receipt of so many submissions that was the key to his decision. For the first lot I can be contacted by phone and email; for the second email only and for the third I will have no communication other than by satellite phone. If you have any issues, please contact our chair, Bill Blessing. The recent AGM (7/10/2017) in the Tothills was a great success with 25 people at the meeting and a really good feeling of friendship and “belonging”. Seven people camped on the Friday and they were joined by a further five on the Saturday night. Some interesting conversations were had amid the smoke around the campfire. John took those interested on short walks to see orchids and to investigate the differences in the two Pultenaea species and many other species came under scrutiny as well. Our guest speaker for the day was Denzel Murfet, Company member and botanist extraordinaire. Denzel outlined the history behind the establishment of the website saseedbank.com.au. He then talked, with the use of charts, on how to navigate through the website for the information it holds. After 5 years of dedicated work by some very keen volunteer botanists (including Denzel), the website now has some 2800 of SA’s 3500 plants listed with detailed information/ photographs of each, maps of distribution and links to other useful botanical sites. This site is well worth a look. New members, though absent, were welcomed to the Company by the Chair (Bill Blessing) who later gave a brief summary of events over the past year. Among things mentioned were the death of Bill Matheson and the generousity of the family in naming Bushland the beneficiary of any donations (which came to $845); the possibility of fossil footprints on our KI property after they were found 2 km west of Mouth Flat; the successful working bee held at Rockleigh and the completion of the update of the management plans (though still at the printers). In his property report for the Tothills, John mentioned the completion of a cull of kangaroos and the need for a further cull as numbers are still damagingly high. The Rockleigh report included information on the memorial planting for 2018 in Bill Matheson’s honour. We have had an excellent response to the appeal for growers, many thanks to all concerned, and hope for an equally good response next year when a working bee will be called to plant the trees and shrubs.
. “that access will not be granted to Bushland properties for commercial ventures except under exceptional circumstances as approved by the Board”. This motion had arisen as a result of Bushland being approached by a private concern for permission to film a commercial at Black Point and was arrived at after much discussion. Next year’s AGM will be held on KI, hopefully on the middle weekend of the holidays (6th Oct). Once the date is finalized early next year I will make it official in a newsletter. John and Reiko have offered accommodation at their nearby property if you do not wish to camp. The annual call of $100 is now overdue. Many thanks to the 36 who have already paid. If you have any problems paying at this time please let me know. Those of you who have not as yet said whether you would like a printed copy of the updated management plans, please do so by the end of next week (Friday 18th Aug). My thanks to those of you who promptly replied. If you don’t receive emails you will get a copy of the plans. Denzel Murfett will speak of his work photographing and collecting the seeds of rare plants. See (http://saseedbank.com.au/). Retiring Directors are myself, Alison Bullock and Bren Lay. All three of us have renominated . If you would like to become a Director, and particularly if you would like the challenge of being secretary at some stage, please nominate yourself by letting me know by the end of August or have someone nominate you at the meeting. A very successful working bee was conducted over the last weekend of July despite some very unpleasant weather. The track to the old campsite which had been overgrown by all the regrowth was tamed and the track itself repaired and upgraded to ensure water causes less erosion. The netting on the northern boundary fence was reattached where necessary and kangaroo runs filled in to prevent access by sheep. Some 50-60 plants were planted and many guards removed or replaced. Much weeding around plants was carried out. The invading false caper, Euphorbia terracina, was hand pulled but is an ongoing problem. Quite a bit of veldt grass was removed from the campsite area and around established plantings. Due to the high winds and some rain we were unable to do the spraying of the slashed area of veldt grass or remove overhanging limbs along the southern fence line. That will be done in the next few weeks by the Rockleigh management group. See below for more details. Weather wise it was a miserable weekend with very strong winds and quite a bit of rain. Cosequently, campers were at a minimum but much was achieved. On the Saturday we had 11 people present, Bren and Elizabeth, John and Reiko, John S, David, Tom R., Tom B., Barbara, Margaret and me. The overgrown track leading to the old campsite was cleared and the track itself repaired. (The problem with the track is water running down and eroding it. Banks have been formed to direct the water away from the track.) Lots of false caper was pulled up from the roadside and in our property nearby and the northern fence line was repaired and kangaroo “runs” blocked where they gave access to sheep. Some 40 odd plants were put in the ground, some guards removed and others replaced. Several of the young Casuarinas had been damaged by kangaroos as they grew above the smaller guards. Larger guards, those made by Ross several years ago, were put over these. Lots of veldt grass plants were removed at and near the campsite. This is an area where the veldt grass is not so prolific and provides an opportunity to manually remove it. Marg’s wish is that everyone who goes to Rockleigh makes a point of removing at least 6 plants in this area each visit. The campsite area is looking really good with native grasses now predominant. Lunch on the Saturday was a sausage sizzle and salads which was enjoyed by all as we sat around out of the wind. There was plenty of discussion as we also enjoyed tea and a variety of cakes. Many thanks to our small Rockleigh Management Group for their supplies and preparation. On Sunday we had 5 on deck; new member Michelle, Janet, Andrew, Marg and me. Andrew had 14 Accacia argyrophylla plants which we put in on the sandy rise at the back of the old camp site. We spent the rest of the morning removing the remaining false caper plants from the roadside. After lunch, eaten while sheltering from the rain, we spent the time removing guards, weeding seedlings and upgrading guards where possible. Many thanks to all who helped out. Despite not being able to do the spraying of the Veldt grass as planned because of the inclement conditions, I think everyone was pleased with just how much was accomplished. Those of us who helped at the working bee at Rockleigh on the wintry weekend of July 29-30 were well rewarded by seeing the results of all the hard work that had gone before. In particular, the sustained revegetation of the previously cleared cropping land along the road is now a delight. 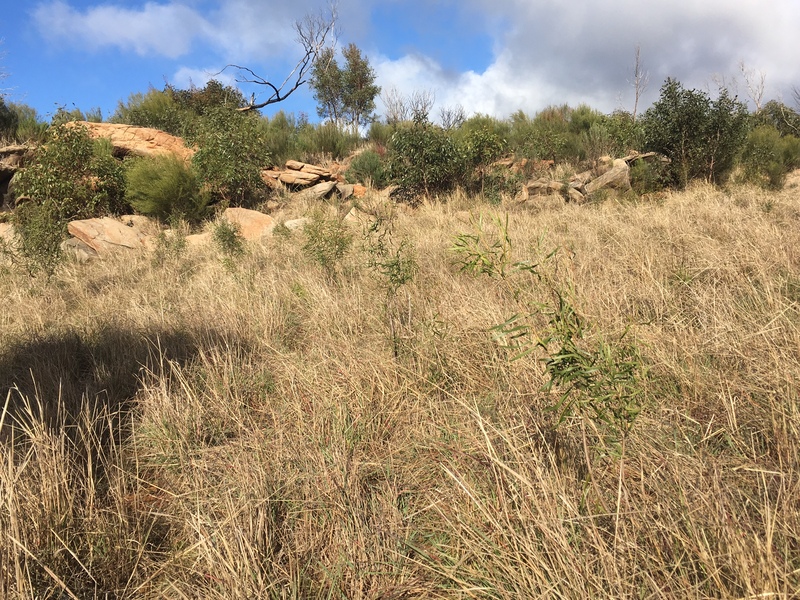 The range of species planted over many years, their recovery from the bushfire, and the appearance of spontaneous seedlings show how worthwhile it has been. 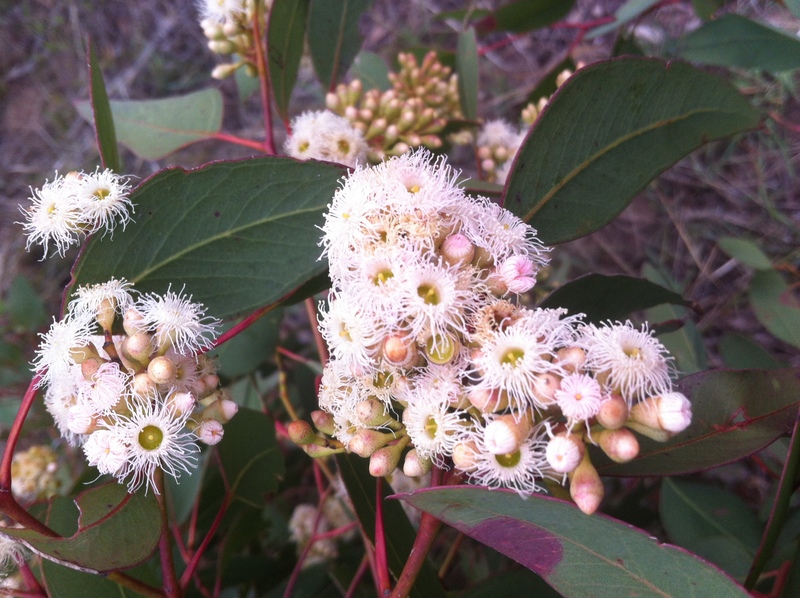 Two standouts were eucalypts in full bloom, the pink-flowered blue gum (Eucalyptus leucoxylon ssp.leucoxylon), and the white-flowered pink gum (E. fasciculata). The blue gum drops a carpet of pink blossoms from mature trees along the roadside just to the east of our block, and it is great that it is natural in the area. Such coloured forms are sold in nurseries as E. leucoxylon ‘Rosea’. The pink gum is close to the northern limit of its range at Rockleigh. It is “almost” a South Australian endemic, with a few stands in the Little Desert of western Victoria, just over the border from the South East population. Its name E. fasciculata comes from the bundles (“fascicles”) of terminal flowers so prominent when it is in flower (see photo). The lack on anthers on the outer long stamens is also characteristic of this species. As many of you will know, Bill Matheson, one of our greatly respected shareholders passed away in May. Bill was instrumental in the management of our Rockleigh property and a Director for 14 years. Our thoughts and best wishes go to Doreen and family. John Smyth recently organized the filling in of the well near the ruin at Webb Gap in the Tothills. The well was collapsing and a potential risk for youngsters in particular. Our thanks to shareholder Greg Schmall and son Jared for carrying out the work. Two down and one to go! Attached is a copy of the updated Tothills Management Plan. Many thanks to all contributors whether in rewriting out of date sections, updating details, proof reading, supplying photos or putting it all together. We all hope you enjoy the finished product. One tricky bit is what to do about printed copies? Can you print a coloured version for yourself or are you like me and have a black and white printer? I would be interested to hear from you whether you would like the Company to print copies for everyone (once all plans are complete) or whether to leave it to individuals to do their own. The Company will need to print copies for the half a dozen members without emails and we will continue to supply new shareholders with a printed copy. It seems that we will not have a tree planting weekend at Rockleigh this year. For the growers with left overs from last year I would suggest that if you can get your plants to me, Bren Lay, Marg Brown or Tom Reeves that we will ensure they get planted. John recently hosted a good gathering of the Friends of Private Bushland group on our Tothills property. The weather was great and John conducted a short and interesting walk in the Webb Gap area after giving the group a rundown on the history of our Company. The highlight was the mass of yakkas growing on the rocky ridge above the campsite. Despite having finished flowering they provided a spectacular scene. (See the first photograph in the Management Plan taken a few weeks prior to this outing). Thanks John. Copyright © 2019 Bushland Conservation Pty Ltd All Rights Reserved.